This DTC is stored when an error occurs in communication between the transponder key amplifier and the transponder key ECU assembly. Some noise is found in the communication line. Keys are positioned too close to each other, or noise occurs in communication line. If the transponder key ECU assembly is replaced, register the key and ECU communication ID (See page ). 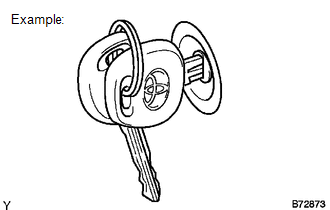 (a) Check whether the ignition key being used is near other ignition keys, as shown in the illustration. Also, check whether the key ring is in contact with the key grip. Key is near other keys and/or key ring is in contact with key grip. Key is not near other keys and key ring is not in contact with key grip. (a) Separate the keys from each other or remove the key ring. (c) Insert a key into the ignition key cylinder and remove the key. Repeat for all the other keys of the vehicle. (a) Replace the transponder key amplifier (See page ). (a) Check that the engine starts.